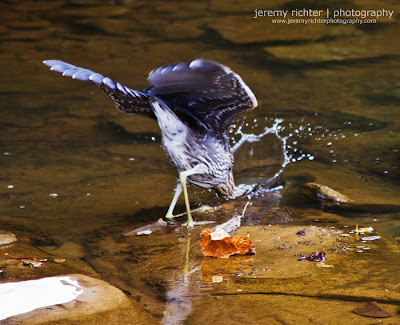 This juvenile Yellow Crowned Night Heron spent much of his morning flitting from one part to another of Black Creek at Black Creek Park in Fultondale, Alabama. After a while I had begun to think this heron's meanderings were almost entirely purposeless, but I was wrong. He was in search of a good fishing hole. Upon spying one, he got very still, and suddenly struck, quick as lightning, and successfully surfaced with a plump crawdad.